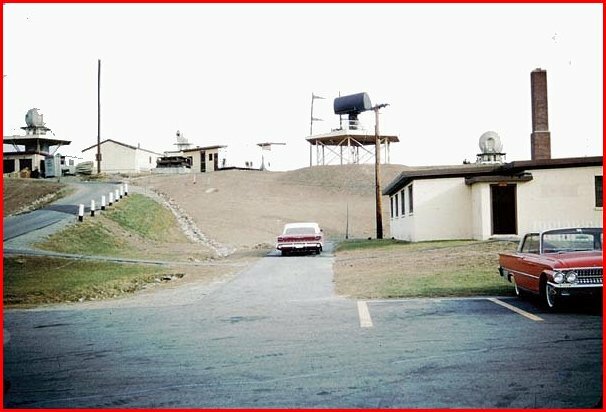 Radar Course Directing Central (RCDC) was the technical name for the Integrated Fire Control (IFC) area of a Nike Missile Site. All command and control of the missile, to include its firing, originated from this area. The radar course directing central (RCDC) consists of the ground guidance equipment located in the battery control area. The functional relationships of the major subsystems of the RCDC are illustrated in figure 9. Each block represents a functional subsystem of the RCDC except the blocks that are shown with broken lines. The tactical control system relays tactical control data, consisting of information and orders, among all areas of the Improve Nike-Hercules System or the Nike-Hercules ATBM System. Note. The function of the RCDC in the Nike-Hercules ATBM System is the same as that of the RCDC in the Improved Nike-Hercules System. a. 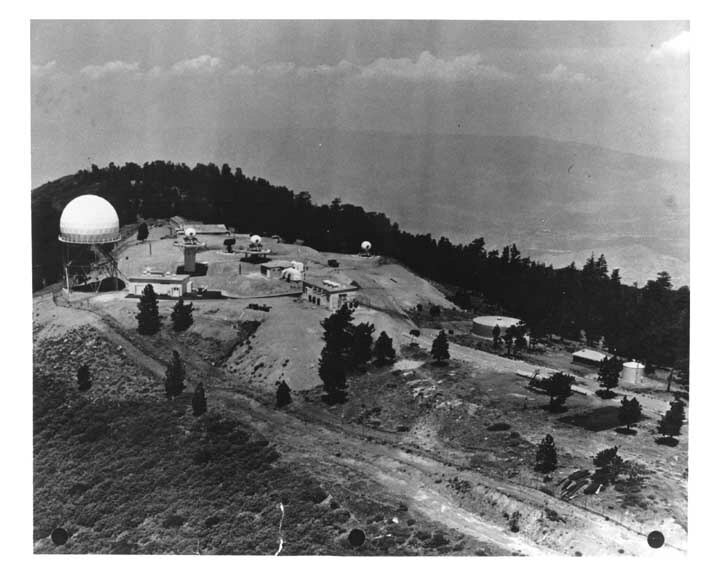 In a surface-to-air mission, the high power acquisition radar (HIPAR) (f`ig 9). the auxiliary acquisition radar (AAR) and the low power acquisition radar (LOPAR) transmit pulsed RF energy form continuously rotating. highly directional antenna. An object in the path of the transmitted RF energy reflects a portion of the energy back to the antenna. The acquisition radar system converts the reflected RF energy into video for display on cathode-ray tube indicators. The radar select circuit permits selection of either HIPAR/AAR or LOPAR video for display. a.1. Anti-jam display (AJD) facilities are provided for both the HIPAR/AAR and the LOPAR systems. In the presence of enemy jamming, the AJD allows the target to remain visible on the cathode-ray tube indicators. b. 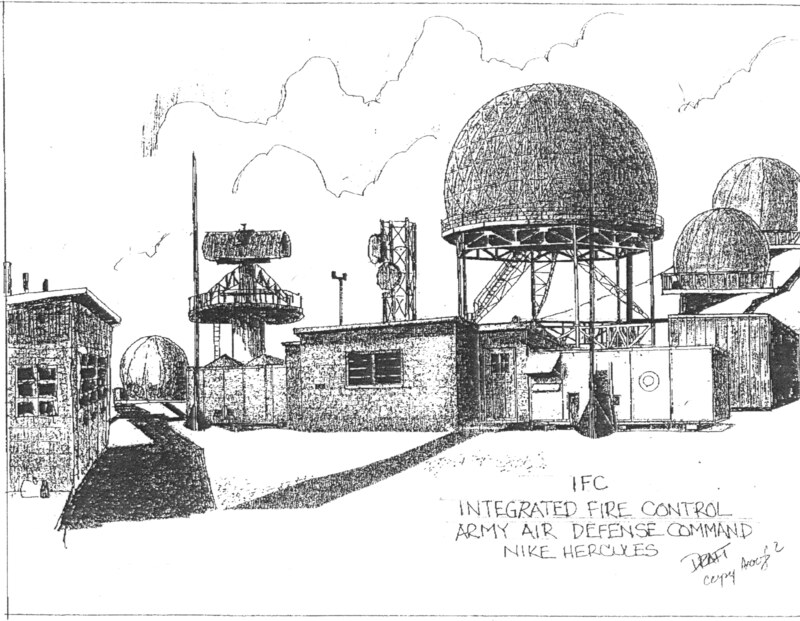 An identification friend or foe (IFF) system also is associated with each of the two acquisition radar systems. When IFF identification of an unidentified object is required, the IFF system transmits IFF interrogation pulses to the unidentified object. If the object is a friendly aircraft with IFF equipment, IFF response pulses are transmitted by the aircraft and received by the IFF system. The IFF response pulses are converted into IFF video for display on the cathode-ray tube indicators. c. Tactical control data from an Army Air Defense Command Post (AADCP) is supplied through either the fire unit integration facility (FUIF) or the battery terminal equipment (BTE) to the tactical control system. If the tactical control data received by the tactical control system from the AADCP or IFF indicates that the unidentified object is an enemy aircraft or missile, the object is designated as a target. Designated target position data, derived from the selected acquisition radar display, is supplied to the target tracking radar (TTR) system. d. The designated target position data aids the target tracking radar operators is acquiring the target. The TTR system transmits a beam of RF energy to the designated target and receives the reflected RF energy. The reflected RF energy enables the TTR system to track the target and to provide continuous target position data to the computer system. The TTR system provides antenna position data to the target ranging radar (TRR) system. The TRR system, slaved to the TTR system, also tracks the target by transmitting RF energy and receiving the RF energy reflected from the target. The TRR system supplies range video to the TTR system. The continuous target position data supplied the computer system consists of azimuth and elevation data from the TTR system and range data from either the TTR of TRR system. The use of two radar systems for range tracking provides advantages in combating enemy electronic countermeasures (ECM). e. Tactical control data, such as missile, mission, and warhead designation and the fire command, is supplied to the launching control group from the tactical control system. When a target is being tracked, the computer system continuously calculates a predicted intercept point, determined from the target position data supplied by the TTR system. The computer systems sends gyro azimuth preset data through the launching control group to the designated missile on a launcher. The gyro azimuth preset data orients a roll amount of gyro in the missile. This gyro provides a stable reference that enables the missile to roll automatically to a predetermined attitude, after launch, relative to the predicted intercept point. f. While the target is being tracked, the computer system sends steering orders to the missile tracking radar (MTR) system. The MTR system converts the steering orders to guidance commands, consisting of coded pulses of RF energy, that are transmitted to the designated missile on a launcher. A transponder in the missile responds to the guidance commands by transmitting RF response pulses. The transmitted missile response pulses enable the MTR system to "lock on" the designated missile prior to launch and to track the missile after launch. g. The fire command is generated manually and sent from the tactical control system to the launching control group as tactical control data, then to the missile on the launcher as the launch order. h. After the missile is launched and has separated form the rocket motor cluster, the missile rolls to the attitude determined before launch by the setting of the roll amount gyro and heads in the direction of the predicted intercept point. The computer system, receiving continuous target position data from the TTR system and continuous missile position data from the MTR system, determines that maneuvers are necessary to cause the missile to intercept the target and sends the appropriate steering orders to the MTR system. The MTR system converts the steering orders to guidance commands that are transmitted to the missile. i. The missile guidance set converts the guidance commands into control surface deflections that produce the required missile maneuvers. The missile continues to transmit response pulses which enable the MTR system to track the missile and supply continuous missile position data to the computer. j. When the missile is within lethal range of the target, the computer system sends a burst order to the MTR system. The MTR system transmits a burst command that detonates the missile. k. A designated missile on a launcher may be rejected either manually or automatically. If it is determined that a designated missile is incapable of completing a successful mission for any reason, a manual missile reject signal is sent to the batter control area. An automatic missile reject signal is sent by the computer system if a designated missile does not ascend from the launcher within 5 seconds after the fire command. When a designated missile is rejected by either method, another missile must then be designated. l. The fire command is normally sent over the tactical control circuits to the launching control group, then to the missile as the launch order. In emergencies, if the tactical control circuits are disrupted, the fire command and other tactical control data can be relayed through the voice communications system to the launching control group or to the launching control section. The firing circuit is then completed by an operator at the launching control group or launching section. m. In a surface-to-surface mission, the RCDC functions are essentially the same as in a surface-to-air mission, except for the differences described in paragraph 13.
a. 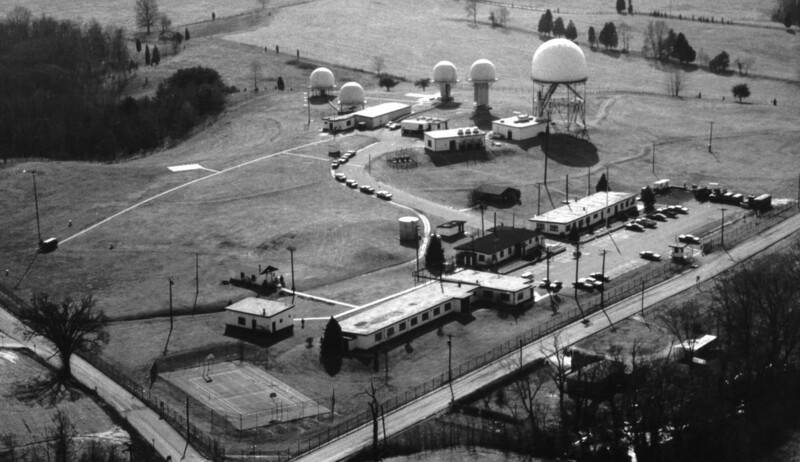 The radar course directing central (RCDC) described in the manual is emplaced as a fixed or mobile defense installation in the Continental United States (CONUS). Two general site configurations are used. These two configurations are the "inline" with advantages of minimum radar masking, and the "T", with advantages of equipment location and real estate economy. The RCDC for the Improved Nike-Hercules Air Defense Guided Missile System can be emplaced either with or without the high power acquisition radar (HIPAR) or auxiliary acquisition radar (AAR). The RCDC for the Nike-Hercules ATBM System shall be emplaced with the HIPAR/AAR. b. Variations of the two general fixed site configurations are described in paragraphs 20 and 20.1. A typical site configuration for a mobile installation is described in paragraph 20.2. The orientation of the RCDC with respect to the primary target line should be as specified; however, this in not a mandatory requirement. In an individual site other considerations, such as real estate availability, may make a different alignment necessary. The inline configuration is preferred for Improved Nike-Hercules and Nike-Hercules ATBM sites where sufficient suitable real estate is available. The inline configuration can be either a consolidated or nonconsolidated site, as described in a and b below. Note. The key numbers in parentheses in a below refer to figure 8.
a. Consolidated Site. The consolidated inline configuration is preferred for the new Improved Nike-Hercules and the Nike-Hercules ATBM sites. A typical consolidated inline layout is shown in figure 8 . The HIPAR antenna radome-support-tripod (13) or the AAR antenna (14), HIPAR building (11) or AAR shelter (15), target track antenna-receiver transmitter group (8), target range antenna-receiver-transmitter group (6) are centered along a straight line parallel with the primary target line. The LOPAR antenna-receiver-transmitter group (5) is located to either side of the centerline, a minimum of 100 feet from the nearest track or range antenna-receiver-transmitter group (6,7, or 8), and a minimum of 50 feet from both the trailer mounted director station (9) and the trailer mounted tracking station (10). 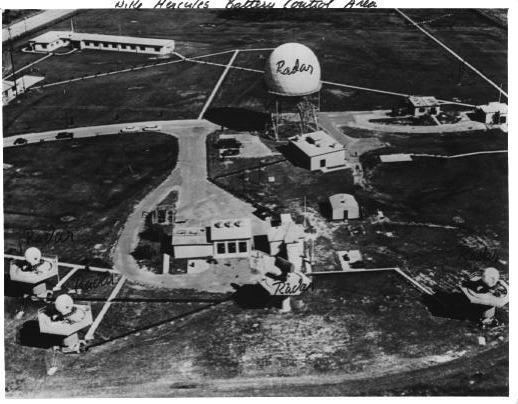 The radar test set group (4) is located between 600 and 680 feet to either side of the centerline and within 80 feet of a line perpendicular to the centerline and midway between the target track antenna-receiver-transmitter group (8) and the missile track antenna-receiver-transmitter group (6). Unrestricted line-of-site is maintained between the radar test set group (4) and the track and range antenna-receiver-transmitter groups (6,7 and 8). The trailer mounted director station (9) and the trailer mounted tracking station (10) are joined to the HIPAR building (11). The power building (12) is located near the HIPAR building. 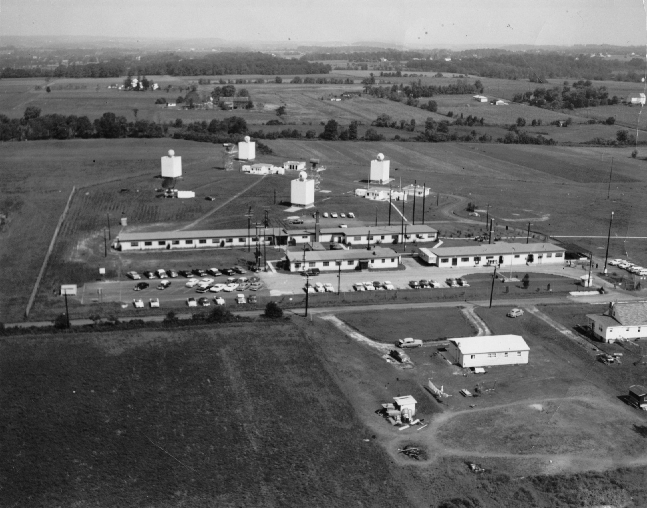 b. Nonconsolidated Site. The nonconsolidated inline configuration is employed at sites converted from Nike-Hercules to Improved Nike-Hercules or Nike-Hercules ATBM where relocation of equipment to an inline configuration is practical. 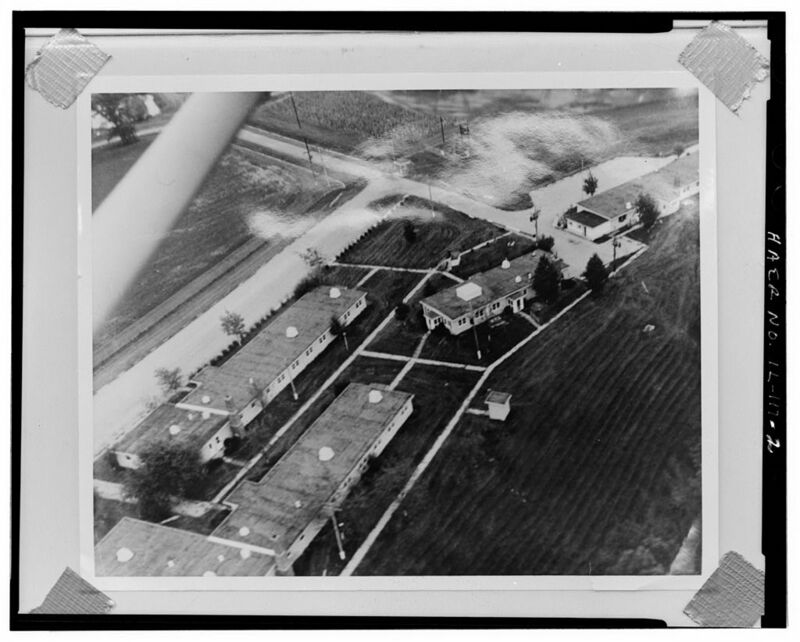 This configuration makes use of the existing Nike-Hercules buildings. The arrangement of the radar equipment (4, 5, 6, 7, 8 and 13, (fig 8) is the same as in the consolidated inline configuration. However, the arrangement of the trailer mounted tracking station and trailer mounted director station and the configuration of the HIPAR building are as shown in fig 10 , which illustrates a nonconsolidated "T" layout. 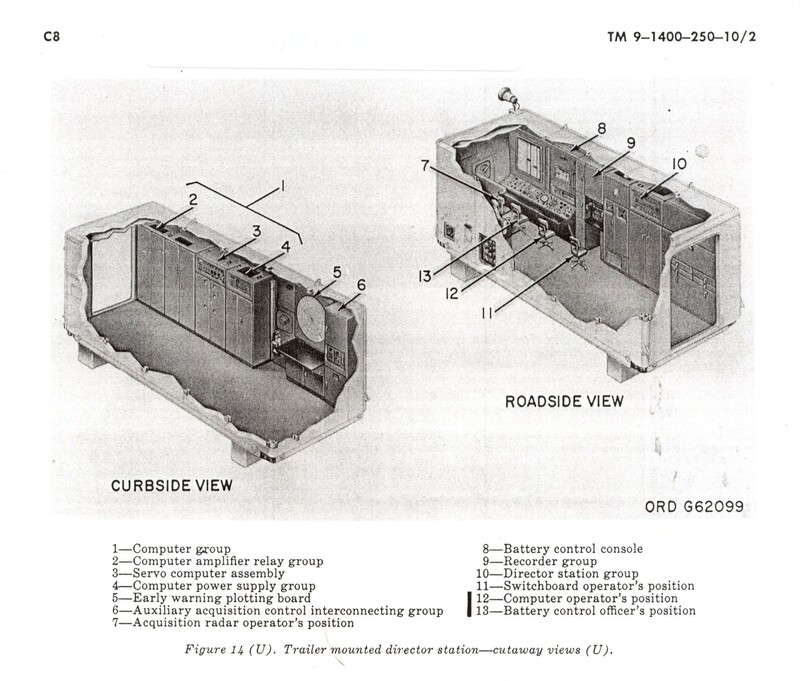 In a nonconsolidated site (either "T" or inline) the trailer mounted tracking station (5, fig 10) and the trailer mounted director station (7, fig. 10) are attached to the existing electronic shop building (6, fig 10) instead of the HIPAR building (9, fig 10). Note. The key numbers shown in parentheses in this paragraph refer to figure 8. The "T" configuration (fig. 10) is nonconsolidated and is employed at sites converted from Nike-Hercules to Improved Nike-Hercules or Nike-Hercules ATBM where conversion to an inline configuration is not practical. The HIPAR antenna radome-support-tripod (10) or the AAR antenna (12), the HIPAR building (9) or the AAR shelter (13), and the electronic shop building (6) are arranged on a line parallel to the primary target line. 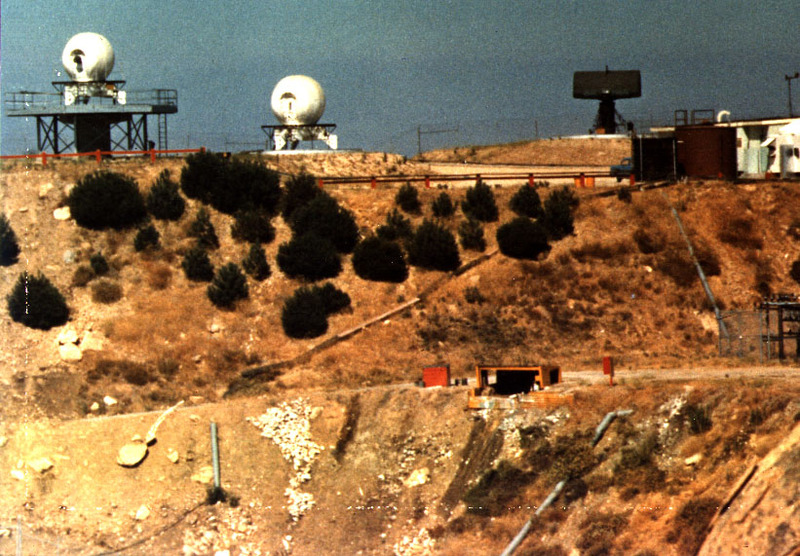 The radar test set group (11) is emplaced behind the HIPAR antenna radome=support-tripod (10), no more than 80 feet to either side, and with unrestricted line-of-sight to the target track, target range, and missile track antenna-receiver-transmitter groups (1, 2, and 4). The trailer mounted tracking station (5) and the trailer mounted director station (7), are attached to the electronic shop building (6). The power building (8) is located near the electronic shop building. The LOPAR antenna-receiver-transmitter group (3) is located a minimum of 100 feet from the nearest track or range antenna-receiver-transmitter group (1, 2, or 4) and a minimum of 50 feet from both the trailer mounted director station (7) and the trailer mounted tracking station (5). a. Either the inline or "T" configuration may be used for a mobile installation. The "T" configuration provides minimum equipment masking for emplacement on flat terrain. The inline configuration can be used to advantage only if the system is emplaced on sloping terrain. Figure 10.1 illustrates typical equipment locations for inline and "T" configurations of the Mobile Nike-Hercules ATBM System with the mobile AJI HIPAR system. b. For both the inline and the "T" configuration, the AJI HIPAR equipment vans are grouped around a line parallel with the primary target line. The tracking and director stations are located adjacent to each other at one end of the AJI HIPAR system power plant van. The electronic shop is located at the opposite end of the power plant van. c. For the inline configuration, the target track antenna-receiver-transmitter group, target range antenna-receiver-transmitter group, and missile track antenna-receiver-transmitter group are centered along a straight line that is parallel with the primary target line and that extends through the center of the mobile AJI HIPAR system equipment grouping. The LOPAR antenna-receiver-transmitter group is located to one side of the center line, a minimum of 100 feet from the target range and missile track antenna-receiver-transmitter groups. 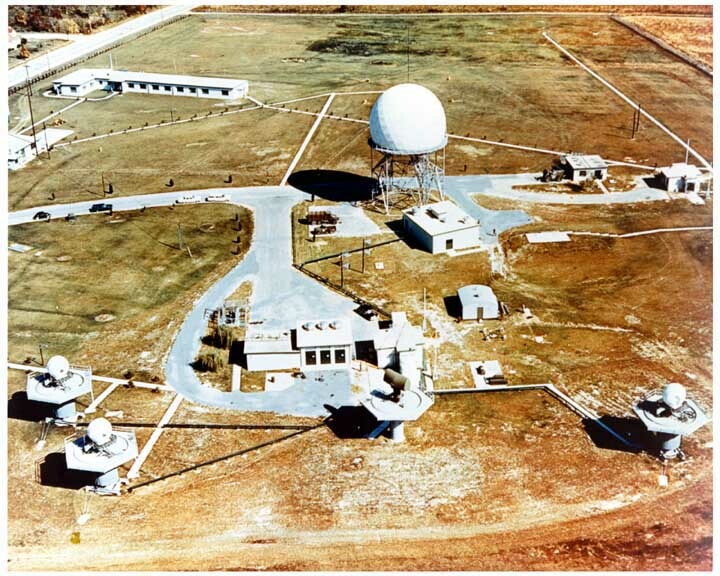 The radar test set group is located 600 feet to one side of the center line that extends through the target range and missile track antenna-receiver-transmitter groups. d. For the "T" configuration, the mobile AJI HIPAR system equipment vans, the tracking and director stations, and the electronic shop are located as described in b above. The target range, target track, and missile track antenna-receiver-transmitter groups are located on a line perpendicular to the primary target line. The LOPAR antenna-receiver-transmitter group is locate a minimum of 50 feet from the tracking station and 100 feet from the missile track antenna-receiver-transmitter group. 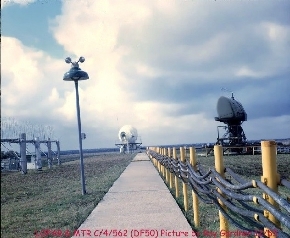 The radar test set group is emplaced behind the mobile antenna, 600 feet from the line on which the target track, target range, and missile track antenna-receiver-transmitter groups are located. a. General. The HIPAR building (fig. 11) contains all the equipment for the AJI HIPAR system, except the HIPAR antenna and the antenna radome-support-tripod. The equipment is described in b through p below. In addition, the storage space is provided in the HIPAR building for organizational repair parts, tools, and test equipment for the AJI HIPAR system. A work space is also provided for repair of equipment. In a consolidated site, the fire unit integration facility (FUIF) equipment is installed in the FUIF room (2, fig. 11) at one end of the HIPAR building. 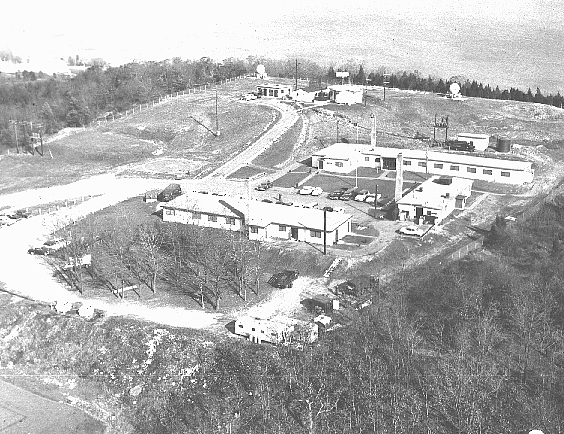 The layout of the HIPAR building in a nonconsolidated site is approximately the same as that of the consolidated site HIPAR building shown in fig. 11, except that the FUIF room is omitted and the trailer mounted director station (3) and the trailer mounted tracking station (1) are not attached. In a nonconsolidated site, the FUIF equipment is installed in the electronic shop building 6, (fig. 10), and the trailer mounted tracking station (5) and the trailer mounted director station (7) are joined to the electronic shop building instead of to the HIPAR building. b. Antenna Coupler Group. The antenna coupler group consists of a system of waveguides and associated microwave components connecting the klystron amplifier (9, fig. 11 ) and the receiver group (16) with the HIPAR antenna (3, fig. 12) . The components are the duplexer assembly (13, fig. 11), waveguide switch (12), dummy load (11), noise coupler and generator (14), and the airline support assembly (15). c. Liquid Cooler. The liquid cooler (17) is used to remove and transfer to the atmosphere heat generated in the klystron amplifier (9) and the dummy load (11). c.1. Pumping Unit. The pumping unit (8) circulates the glycol solution through the klystron amplifier (9) and the liquid cooler (17). d. Control-Oscillator Group. The control-oscillator group (18) is used to provide system synchronization pulses and RF signals. During normal operation, the synchronizing pulses are distributed throughout the HIPAR system and the other radar systems of the radar course directing central as basic timing pulses. The RF signals are used as the final RF drive for the klystron amplifier (9) and the local oscillator signal for the receiver group (16). Pushbutton selection of any one of the ten preset operating frequencies may be controlled form either the trailer mounted director station (3) or transmitter control indicator (19). e. Transmitter Control-Indicator. The transmitter control-indicator (19) is used to monitor and control the transmitter system. f. Waveguide Pressurizer . The waveguide pressurizer (20) is used to provide a continuously controlled supply of pressurized dry air to the antenna coupler group (b above). g. Induction Voltage Regulator. The induction voltage regulator (21) is used to control the level of 3-phase, primary voltage applied to the high voltage power supply (4). h. Power Distribution Unit. The power distribution unit (22) is used to regulate and supply power to other units in the HIPAR building. It also contains a +28-volt dc power supply for the low voltage circuits of the AJI HIPAR system. i. High Voltage Power Supply. The high voltage power supply (4) is used to supply high voltage dc to the high voltage pulse generator (5) . j. Air Conditioning Room. The air conditioning room (6) contains the heating and cooling equipment required to maintain a comfortable room temperature in the HIPAR building. In a consolidated site, the air conditioning equipment also controls the atmosphere in the trailer mounted director stations (3) and the trailer mounted tracking station (1) which adjoin the HIPAR building. k. High Voltage Pulse Generator. The high voltage pulse generator (5) is used to develop the high voltage dc (modulating) drive pulse for the klystron amplifier (9). l. Klystron Amplifier. The klystron amplifier (9) is used to develop final RF energy that is supplied by the RF harmonic filter (7) and the antenna coupler group (b above) to the HIPAR antenna (3, fig. 12). m. Receiver Group. The receiver group (16, fig. 11), in conjunction with the moving target indicator group (10), is used to process target return RF energy from the HIPAR antenna (3, fig. 12), and RF energy from the omni (1) and the two auxiliary antennas (7). The four signals noted above are processed to obtain and supply video information to the HIPAR monitor PPU in the receiver group and the battery control console PPI's located in the trailer mounted director station. o. Moving Target Indicator Group. The moving target indicator group (10) is used to differentiate between fixed and moving targets detected by the receiver group (16). p. Simulator Distribution Box. The simulator distribution box (23) is used for connecting the T1 trainer to the EFS HIPAR system. Note. Information pertaining to AJI HIPAR systems 538 and above (except mobile systems) is contained in a through o below. Refer to paragraph 21 for information pertaining to AJI HIPAR systems 502 to 537.
a. General. The HIPAR building contains all the equipment for the AJI HIPAR system except the radar antenna support set and radome (fig. 12), the HIPAR antenna (3, fig. 12), and the liquid cooler (15, fig (11.1.1). the building equipment is described in b through o below. Storage space for organizational repair parts, tools, and test equipment, as well as a work area for equipment repair, is provided in the building. At a consolidated site, the FUIF equipment is installed in the FUIF room (1) at one end of the HIPAR building. The trailer mounted director station (9, fig. 8) and the trailer mounted tracking station (10) are emplaced on each side of the FUIF room and connect to the HIPAR building. At a nonconsolidated site, the FUIF equipment is installed in the electronic shop building (6, fig. 10). The trailer mounted director station (7) and the trailer mounted tracking station (5) are joined to the electronic shop building (6). b. High Voltage Power Supply. The high voltage power supply (2, fig. 11.1.1) is used to supply high voltage dc to the high voltage pulse generator (3). c. High Voltage Pulse Generator. This high voltage pulse generator (3) is used to develop the high voltage dc (modulating) drive pulse for the klystron amplifier (7). d. RF Harmonic Filter. The RF harmonic filter (4) is used to filter undesirable harmonic frequencies from the final RF energy. e. Antenna Coupler. The antenna coupler consists of a system of waveguides and associated microwave components connecting the klystron amplifier (7) and the receiver group (13) with the HIPAR antenna (3, (fig 12). The components of the antenna coupler are the waveguide sections (6, fig. 11.1.1), dummy load (8), noise couplers and thermal noise generators, (12) duplexer assembly (11), waveguide switch (10). and the airline support assembly (11.1). f. Klystron Amplifier. The klystron amplifier (7) is used to develop the final RF energy that is supplied by the RF harmonic filter (4) and the antenna coupler ( e above) tot he HIPAR antenna (3, fig 12). Input to the klystron amplifier is impedance matched by the pulse transformer (5, fig. 11.1.1). g. Moving Target Indicator Group. The moving target indicator group (9) is used to differentiate between fixed and moving targets detected by the receiver group (13). h. Receiver Group. There receiver group (13) in conjunction with the moving target indicator group (9), is used to process target-return RF energy from the HIPAR antenna (3, fig 12), and RF energy from the omni (1) and two auxiliary antennas (7). 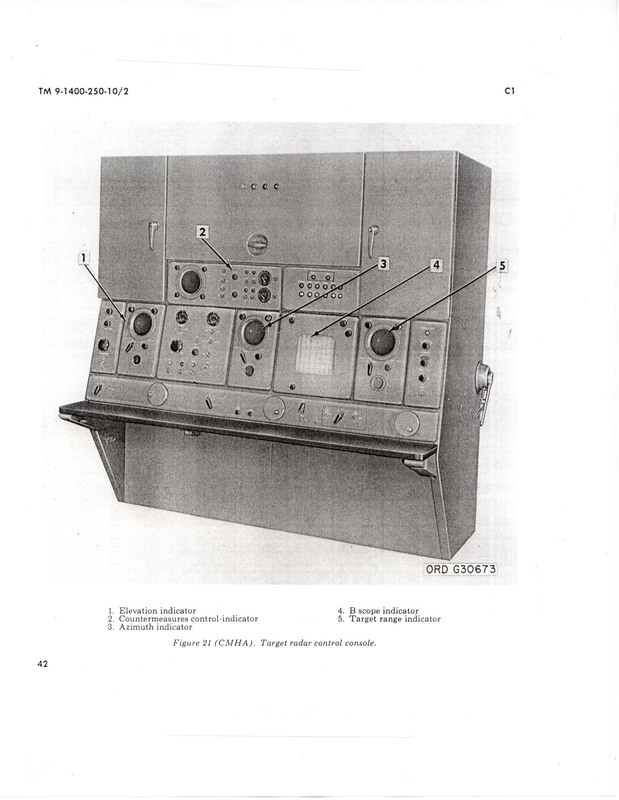 The four signals noted above are processed to obtain and supply video information to the HIPAR monitor PPI in the receiver group and the battery control console PPI's located in the trailer mounted director station (9, fig. 8). i.1. Pumping Unit. The pumping unit (14, fig. 11.1.1) circulates the glycol solution through the klystron amplifier (7), dummy load (8), and the liquid cooler (15). j.1. Liquid Cooler. The liquid cooler (15), located outside the HIPAR building, is used to transfer heat from the glycol solution to the atmosphere. k. Control-Oscillator Group. The control-oscillator group (16) is used to provide system synchronization pulses and RF signals. During normal operation, the synchronizing pulses are distributed throughout the HIPAR system and other radar systems of the radar course directing central as the basic timing pulses. The RF signals are used as the final RF drive for the klystron amplifier (7) and the local oscillator signal for the receiver group (13). Pushbutton selection of any one of the ten preset operating frequencies of the control-oscillator group may be controlled from either the trailer mounted director station (9, fig 8._) of the power control-indicator (17, fig. 11.1.1) . l. Power Control-Indicator. The power control-indicator (17 is used to control and to monitor the distribution of the primary power for the AJI HIPAR system. Transmitter controls, monitoring facilities, and test equipment are included in the power control-indicator that also contains the waveguide pressurizer and the dehydrator unit. The waveguide pressurizer and dehydrator unit are used to provide a continuously controlled supply of dry air, under pressure, to the antenna coupler (e above) and the RF harmonic filter (4). m. Induction Voltage Regulator. The induction voltage regulator (18) is used to control the voltage level of the stepped-up primary voltage applied to the high voltage power supply (2). Operation of the induction voltage regulator (1) is controlled from the power control-indicator (17). n. Step-up Power Transformer. The step-up power transformer (19) is used to provide stepped-up primary voltage to the induction voltage regulator (18). o. Simulator Distribution Box. The simulator distribution box (20) is used for connecting the T! trainer to the EFS/ATBM HIPAR system. a. HIPAR Antenna Radome-Support-Tripod. The HIPAR antenna radome-support-tripod (2, 4, and 5, ( fig. 12) supports and houses the HIPAR CSC antenna. Major components of the HIPAR antenna radome-support-tripod are the radome (2) which encloses the HIPAR CSC antenna, and the antenna tripod (5) and the radome support (4) which support the HIPAR CSC antenna. The antenna radome-support-tripod may be emplaced either with or without the radome support extension (6), depending upon the individual site requirements. b. CSC Omni Antenna. The CSC omni antenna (1) is used to receive and supply a sample of the target-returned energy through the antenna coupler. c. HIPAR CSC Antenna. The HIPAR CSC antenna (3) is used to transmit RF energy supplied from the antenna coupler. In addition, the HIPAR CSC antenna receives and supplies target-return RF energy through the antenna coupler to the receiver group (16, fig. 11) . d. Auxiliary Antennas. The two auxiliary antennas (7, fig. 12) are unidirectional, fixed-type receiving antennas used to intercept interfering signals in the side lobes of the HIPAR CSC antenna. Each antenna is mounted on a mast that is fixed to the back of the HIPAR CSC antenna..
a. HIPAR Antenna Radome-Support-Tripod and Auxiliary Antennas. The radome-support-tripod and the auxiliary antennas are identical in the cosecant squared and fan configurations. Refer to paragraph 22 for the description. b. FAN Omni Antenna. The reflector of the FAN omni antenna is physically reversed from the reflector of the CSC omni antenna (1, fig. 12 ), but the two antennas function in an identical manner. Refer to paragraph 22 for the description. c. HIPAR FAN Antenna. The HIPAR FAN antenna reflector is reduced in height from the HIPAR CSC antenna reflector. This reduction in reflector height provides a better high altitude coverage, but the fan antenna is more susceptible to high altitude jamming. With these exceptions, the HIPAR FAN antenna is physically and functionally similar to the HIPAR CSC antenna. Refer to paragraph 22 for the description. The AAR may be installed at selected sites for use with the Improved Nike-Hercules System. The AAR equipment is described in a and b below. a. Antenna Group. The antenna group consists of the antenna (1, fig. 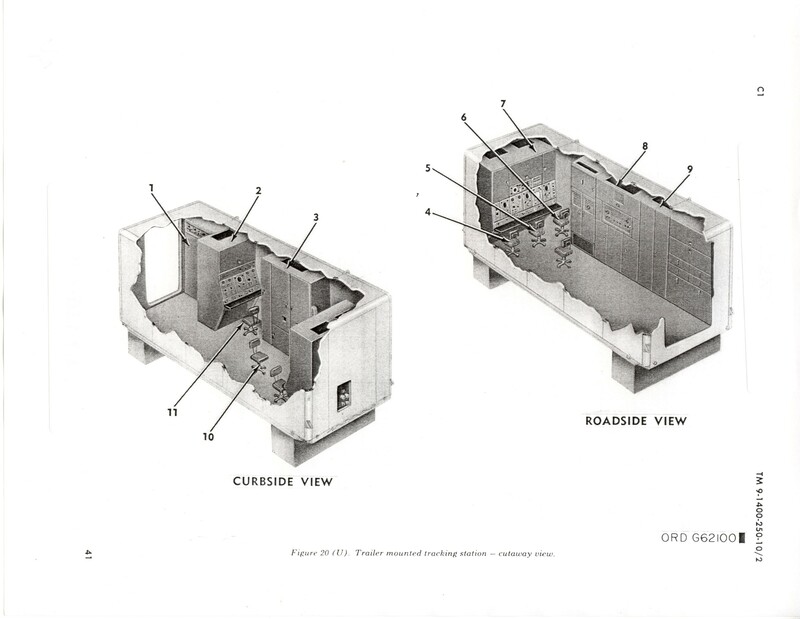 11.2 ), the antenna pedestal (6), a power cable (4), and the waveguide section (2) which connects the antenna pedestal to the duplexer in the AAR shelter (3). The antenna and antenna pedestal are mounted on a reinforced concrete base (5). b. AAR Shelter. The AAR shelter contains all the equipment of the AAR operating group and the associated plan position indicator (PPI). The trailer mounted director station (fig. 14) contains the computer equipment, recording equipment, tactical control circuits, and voice communications equipment required for the operation of the tactical control system and the acquisition radar systems. Major units located within the trailer mounted director station are described in a through g below. a. Director Station Group. The director station group (10 fig. 14) is located against the curbside wall of the trailer mounted director station. The director station group contains the primary power controls for the trailer lighting, heating, and ventilation equipment, and for the LOPAR system equipment. b. Recorder Group. The recorder group (9) is located against the curbside wall of the trailer mounted director station. The recorder group contains recording equipment and voice communications equipment. The recording equipment provides an automatic film record of equipment performance during a test or tactical engagement. The voice communication equipments consists of a switchboard and related equipment which provide two-way communication between all system telephone locations. c. Battery Control Console. The battery control console (8) is located against the curbside wall of the trailer mounted director station. The battery control console contains controls, presentation indicators, automatic plotting boards, and other equipment associated with the acquisition radar systems (LOPAR and HIPAR/AAR), the computer system, and the tactical control system. Data used by the battery control officer during an engagement is displayed on the horizontal plotting board (1, fig. 15), altitude plotting board (2), PPI (3), and precision indicator (4). The displays on the plotting boards and indicators are described in (1) through (4) below. Note. The plotting display of figure 16 is described in (a) through (c) below. (a) The horizontal plotting board (1, fig. 15) provides means for automatically plotting in range and azimuth a plan view of an entire engagement. A typical engagement plot by the horizontal plotting board is shown in figure 16 . The plotting display is inked on paper and contains three plots in the horizontal plane: a plot showing position of the target ( point B to C ), a plot showing the predicted intercept point (point A to the fire mark at point E), and a plot showing present position of the missile (point D to point C). The center of the plotting board represents the position of the target track antenna-receiver-transmitter group. Range is represented by concentric circles marking 10,000-yard increments from the center of the plotting board. Azimuth is represented by the radial lines that divide the plotting board into 200-mil sectors. Timing marks appear on each plot at about 10-second intervals. TARGET-MISSILE plot indicators at the lower left and right corners of the plotting board indicate which pen is plotting the target position and which pen is plotting the missile position. (b) Before the missile is fired, the horizontal plotting board continuously plots the position of the target (point B to the fire mark at point A) and the position of the predicted intercept point at any instant is based on the assumption of immediate fire. (c) The fire order is transmitted, in this typical engagement plot, when the target is at a range of approximately 135,000 yards and the predicted intercept point is at a range of approximately 95,000 yards. Shortly after the fire order is transmitted, the pen plotting the predicted intercept point returns to approimatelt the center of the plotting board (point D) and begins to plot the position of the missile in the hornizontal plane. The target and missile plots continue until target intercept occurs at the intersection of the two plots (point C). Note. The plotting display of figure 17 is described in (a) through (c). The altitude plotting board (2, fig. 15) provides means for automatically plotting target and missile altitude data against time to intercept data. A typical engagement plot by the altitude plotting board is shown in figure 17. The plotting display is linked on paper and contains three plots in the vertical plane: a plot of the altitude of the predicted intercept point by the right plotting board pen before fire (point C to fire mark), a plot of the altitude of the target by the right plotting pen after fire (fire mark to point B), and a plot of the altitude of the missile by the left plotting pen after fire (point E to point A). Both plotting pens also simultaneously plot the time to intercept along the horizontal axis. The time scale for both plotting pens starts at zero and extends for about 200 seconds. The height scale extends from -5000 feet to 100,000 feet. The timing marks appear on each plot at about 10-second intervals. A fire mark (fig. 17) is made on the target altitude plotting board when the missile is fired. When the target enters the defense area (point C), in this typical engagement plot, the altitude of the predicted intercept point is about 53,000 feet. The plot of the predicted intercept point continues until the time to intercept decreases to about 125 seconds. At this time, the fire order is transmitted as indicated by the fire mark on the plot. Shortly afterwards, the right plotting pen begins to plot present target altitude against time to intercept. As the time to intercept decreases, the two plots move closer together. At zero time to intercept, or at burst time, the missile and target altitudes are coincident (points A and B). The dead zone is an area in which an intercept cannot be made in the normal surface-to-surface mission. PPI. The plan position indicator (PPI) (3, fig. 15) provides a visual means of detecting, observing, identifying, and designating return signals from moving objects and targets within range of the acquisition radar systems. Symbols appearing on the PPI display used by the operator to effect a successful mission are described in (a) and (b) below. Note. The key numbers shown in parentheses in (a) below refer to figure 18. The basic presentation of the PPI is shown in figure 18 and described in 1. through 6 below. This presentation consists of the rotating radial sweep (11), acquisition range circle (5), electronic cross (4), acquisition (flashing) azimuth line (9), target return video signals (3,6,8, and 10), and jam strobes (2 and 7). 1. The rotating radial sweep (11) extends from the center to the outer edge of the face of the PPI. The radial sweep rotates clockwise around the face of the PPI in synchronism with the rotation of the selected acquisition radar antenna (HIPAR/AAR or LOPAR). The complete display is presented on the PPI once each 360-degree rotation of the radial sweep. 2. The electronic cross (4) is illuminated on the face of the PPI once during each rotation of the rotating radial sweep (11). The two lines forming the electronic cross represent the azimuth and range settings of the target tracking radar system. When the electronic cross is centered on the designated target, the electronic cross provides and indication that the target is being accurately tracked in azimuth and in range by the target tracking radar system. The operator may switch the cross in or out of the display as required. The cross in normally used for test and maintenance alignment. During tactical operation, the cross obscures the target video and is, therefore, only switched on momentarily, as required to verify target tracking. 3. The acquisition range circle (5) is traced on the face of the PPI by an acquisition range dot that rotates with the rotating radial sweep (11). The radius of the circle is adjustable through a distance representing 0 to 250,000 yards in range for the LOPAR system and 0 to 350,000 yards for the HIPAR/AAR system. When the acquisition range circle is adjusted to coincide with the target return signals, it represents the range coordinate of the target. 4. The acquisition (flashing) azimuth line (9) appears on the face of the PPI as a brightened stationary radial line once during each rotation of the rotating radial sweep (11). The acquisition (flashing) azimuth line may be steered by rotating an azimuth knob. 5. Target return video signals (3, 6, 8, and 10) are displayed on the face of the PPI when the transmitted radio frequency (RF) pulses are reflected from moving objects or targets within the range of the selected acquisition radar system (HIPAR/AAR or LOPAR). The return signals are displayed as bright dots or irregular areas with each rotation of the rotating radial sweep (11). When a return signal is identified as hostile, the acquisition range circle (5) and the acquisition (flashing) azimuth line (9) are positioned to coincide with the target return signal, automatically providing azimuth and range information to the target tracking radar system. Information that the target has been designated is sent to the trailer mounted tracking station, enabling the operator in the tracking station to slew the target tracking antenna to the target. 6. The jam strobes (2 and 7) appear at the exact azimuth of each jamming target video (3 and 6). The long persistence phosphor of the scope permits numerous jam strobes to be observed simultaneously. If the target is obscured, by the strobe line, only azimuth information is transmitted to the target tracking radar system during the target designate phase of operation. During HIPAR/AAR operation, the length of the strobes may be adjusted. The symbols of either the fire unit integration facility (FUIF) or the battery teminal equipment (BTE) are supplied by the Army Air Defense Command Post (AADCP). The AADCP symbols along with the selective identification facility/identification friend or foe (SIF/IFF) symbols are displayed on the PPI. Detailed information on tactical symbols is contained in chapter 7. Precision Indicator. The precision indicator (4, fig. 15) displays an expanded sector of the PPI display covering 533 mils in azimuth (width) and 25,000 yards in range (height). The expanded portion is centered at the intersection of the horizontal and vertical cross hairs etched in the face of the precision indicator. These cross hairs represent the intersection of the acquisition range circle (5, fig. 18) and the acquisition (flashing) azimuth line (9, fig. 18) on the basic PPI presentation. The expanded display provides better target resolution and permits more accurate determination of the range and azimuth of the designated target. The basic presentation of the precision indicator is shown in figure 19 and described in (a) through (e) below. Note. The key numbers shown in parentheses in (a) through (e) below refer to figure 19 unless otherwise indicated. The acquisition range line (1) is represented by a black horizontal line etched in the face of the precision indicator. This line represents an expanded portion of the acquisition range circle (5, fig. 18) displayed on the PPI. The acquisition azimuth line (3) is represented by a black vertical line etched in the face of the precision indicator. The acquisition azimuth line represents a 25,000-yard range segment of the acquisition (flashing) azimuth line (9, fig. 18) on the PPI, 12,500 yards on each side of the acquisition range circle (5, fig. 18). 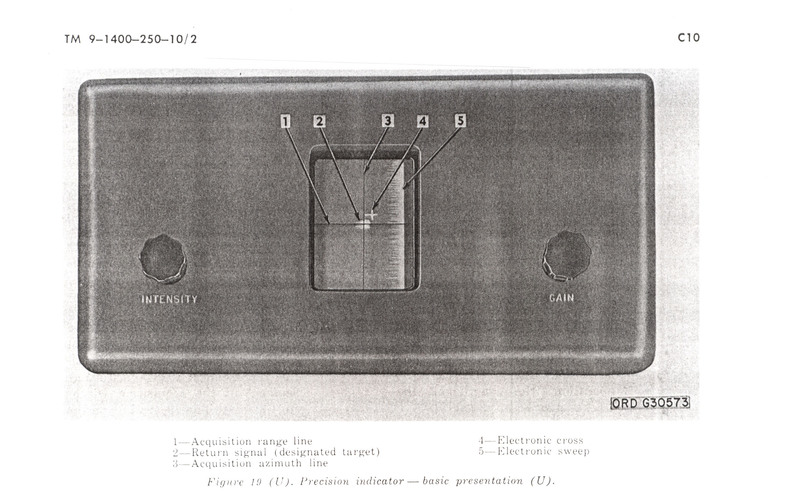 The return signal (designated target) (2) appears as a brightened defocused spot on the face of the precision indicator each time the electronic sweep (5) travels across the face of the precision indicator. The target is centered at the intersection of the acquisition range line (1) and the acquisition azimuth line (3). The electronic cross (4) represents the azimuth and range settings of the target tracking radar systems. The electronic sweep (5) is an illuminated vertical line that extends from the upper edge to the lower edge of the face of the precision indicator. The electronic sweep corresponds to the rotating radial sweep (11, fig. 18) on the PPI and travels across the face of the precision indicator from left to right in synchronism with the rotation of the selected acquisition radar antenna (HIPAR/AAR or LOPAR). d. Auxiliary Acquisition Control Interconnecting Group. The auxiliary control interconnecting group (6, (fig. 14) is located against the roadside wall of the trailer mounted director station. The interconnecting group consists of the HIPAR auxiliary acquisition control indicator, LOPAR auxiliary control indicator, IFF auxiliary control indicator, fixed attenuator, PPI test panel, and anti-jam display (AJD) equipment. Teh controls and indicators on the auxiliary acquisition control interconnecting group provide remote control of the acquisition radar and SIF/IFF systems during test and setup operatons and are not normally used during and engagement. The functions provided include selection of the transmitter frequency for the acquistion radar systems and setting of the codes for the SIF/IIF system. e. Early Warning Plotting Board. The early warning plotting board (5, fig. 14) is located on the roadside wall of the trailer mounted director station. The early warning plotting board provides the battery control officer with target early warning position information. The information is received over the telephone network from the Army Air Defense Command Post (AADCP) and manually plotted by the early warning plotting board operator. f. Computer Group. The computer group (1, fig. 14) is located against the roadside wall of the trailer mounted director station. The computer group consists of the computer amplifier relay group (2, fig. 14), and the servo computer assembly (3, fig. 14), and the computer power supply (4, fig. 14). g. Raar Bomb Scoring Equipment. During radar bomb scoring missions, additional equipment is located in the trailer mounted director station to adapt the Improved Nike-Hercules System for bomb scoring operation. The equipment consists of an RBS control unit (fig. 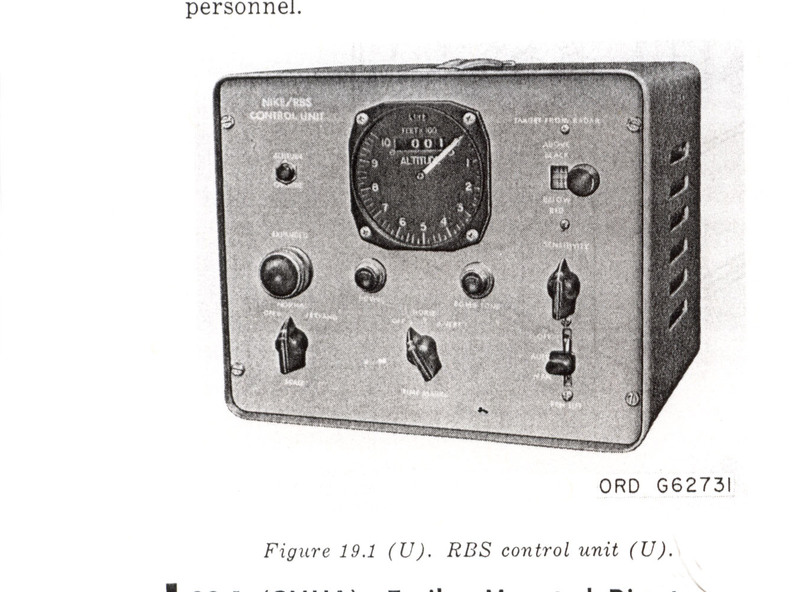 19.1), an RBS scale factor unit, and communications equipment. This additional equipment is Air Force material which is connected to the Improved Nike-Hercules System during radar bomb scoring missions only. The equipment is normally operated by Air Force personnel. a. General. The trailer mounted director station (fig. 19.2) used in the Nike-Hercules ATBM System is similar to that used in the Improved Nike-Hercules System. Refer to paragraph 23 for a description of the director station group (4, fig. 19.2), the recorder group (8, fig. 19.2), the auxiliary acquisition interconnecting group (3, fig. 19.2) and the early warning plotting board (2, fig. 19.2), and radar bomb scoring equipment. b. Battery Control Console. 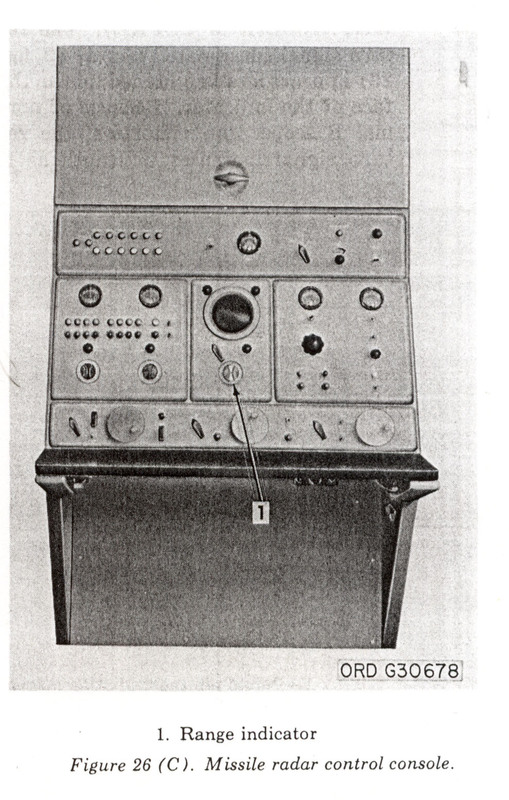 The battery control console (9, fig. 19.2) is located against the curbside wall of the trailer mounted director station. The battery control console contains the PPI's, the automatic plotting boards, the control indicators and other controls associated with the acquisition radar systems, the computer system, and the tactical control system. The horizontal plotting board (1, fig. 19.3), the altitude plotting board (2, fig. 19.3) , the altitude plotting board (2, fig,. 19.3), and the two PPI's (4 and 8, fig. 19.3) display data used during an engagement. Horizontal Plotting Board. For a description of the presentation on the horizontal plotting refer to paragraph 23c (1). The altitude plotting board (2, fig. 19.3) provides means for automatically plotting target and missile altitude data against time-to-intercept data. The altitude plotting board (fig. 19.4) is equally divided into separate surfaces. During an anti-missile (A-M) mission, the TARGET and MISSILE plotting boards provide and altitude coverage of 300,000 feet. During an anti-aircraft (A-A) mission, the TARGET and MISSILE plotting boards provide an altitude coverage of 100,000 feet. The MISSILE (right) plotting surface, graduated from 0 to 200 (center to right) represents time-to-intercept in seconds. The TARGET (left) plotting surface, graduated from 0 to 200 (center to left), represents a time-to-intercept in seconds. Each plotting surface has ten horizontal lines and five vertical lines. Each of the ten horizontal lines represent 10,000 feet in altitude for the antiaircraft mission and 30,000 feet for the anti-missile mission; each of the five vertical line for both plotting boards represent 40 seconds of time-to-intercept. Positions of the points which lie between the lines must be estimated. Engraved on the transparent plastic backboard are two curved lines which represent the dead zones for the Nike-Hercules ATBM System. These curved lines are shown as part of the MISSILE plotting surface on the altitude plotting board. During an anti-missile mission, the A-M mission dead zone is used, and during and antiaircraft mission, the A-A dead zone is used. A typical engagement plot by the altitude plotting board during an antiaircraft mission is displayed on fig. (fig.19.4.) The display shows three plots in the vertical plane: plot of altitude of the predicted intercept point by the MISSILE plotting pen before fire (point C to fire), plot of the altitude of the TARGET plotting pen throughout the entire engagement (point E to point A), and plot of the altitude of the missile by the MISSILE plotting pen shortly after fire (point D to point B). Both pens also simultaneously plot time-to-intercept along the horizontal axis. Timing marks appear on each plot at approximately 10-second intervals. When the target entered the defended area (point C and point E), the altitude of the predicted intercept point was plotted by the MISSILE plotting pen at approximately 53,000 feet. The plot of the altitude of the predicted intercept point continued until the MISSILE pen plotted approximately 125 seconds to time-to-intercept. At this time, the fire order was issued as shown by the fire mark on the TARGET plot. The target plot presents target altitude against time-to-intercept. The MISSILE plotting pen fire stopped plotting predicted intercept point and started to plot missile altitude against time-to-intercept (point D). As time-to-intercept decreased, the two plots moved closer together. At zero time-to-intercept, or burst, the missile and target altitude were coincident (points A and B). Two identical PPI's. both containing cathode-ray storage tubes, are used to display the acquisition presentation of the Nike-Hercules ATBM System. The long-range PPI (4, fig. 19.3) has two range display modes of operation. When the LONG RANGE indicator light illuminates (blue), the range displayed is 350,000 yards. When the SHORT RANGE indicator light illuminates (green), the range displayed is 150,000 yards. The short range PPI (8 fig, 19.3) also has two range display modes of operation. When the LONG RANGE indicator light illuminates the range displayed is 75,000 yards. Except for the actual range coverage, the presentation seen on the short range PPI is the same as seen on the long range PPI. Since the presentation on both PPI's is the same, only the long range PPI will be discussed. The basic targetvideo, reference marks and ECM effects appearing on the PPI are shown on figure 19.5. Note. Key numbers shown in parentheses in (b) below refer to figure 19.5. The basic presentation is displayed on the cathode-ray storage tube (9). The presentation consists of a jamming target (3), quiet target (6), target trace (tail) (8), designated target (11), target designate circle (1), jam strobe (2), chaff cloud or clutter (4), rotating radial sweep (5), target designate circle from other target designate control (7), and track electronic cross (10). These basic types of presentations are discussed in 1 through 8 below. 1. Target Video. Target video becomes a part of the basic presentation when either the LOPAR or HIPAR/AAR system is operating and a target is present within the radar range. Target video appears as a bright spot or arc with each rotation of the rotating radial sweep. Different types of target video may be seen on the PPI. A jamming target may or may not appear in the jam strobe depending upon the output of the jammer and the magnitude of the reflected signal from the target. A quiet target is one not using ECM techniques. The designated target is encircled by the target designate circle. 2. Jam Strobe. The jam strobe will be displayed if CW or noise jamming is present. The jam strobe appears at azimuth of an individual jamming target. If the jamming target is obscured in the strobe and is the target to be engaged, only azimuth information is transmitted to the target tracking radar during the designate phase of operation. 3. Chaff Cloud or Clutter. A chaff cloud or clutter will be displayed on the PPI, but due to the AJD capability of the HIPAR/AAR system, the effect will be greatly reduced. 4. Rotating Radical Sweep. The rotating radial sweep extends from the center of the outer edge of tghe cathode-ray storage tube. The sweep rotates clockwise around the cathode-ray storage tube in synchronism with the rotation of the acquisition antennas (HIPAR/AAR or LOPAR). Once during each revolution, the sweep brightens all displays on the cathode-ray tube as the sweep coincides with each display. 5. Target Designate Circle from other Target Designate Circle. The target designate circle from the other target designate control appears as a semicircle, provided the range control is depressed and the range control is positioned in range. If this designate circle is tracking a target, target video will appear in the center of the semicircle. 6. Target and Trace (tail). When the LOG PERST indicator light illuminates, the persistence of the cathode-ray storage tube is such that video, as well as ECM, remains on the face of the PPI. A trace (tail) will be left behind a moving target. To remove these traces the ERASE switch is depressed. 7. Target Designate Circle. The target designate circle appears as a circle on the PPI, provided the range control is depressed and is positioned in range to a point other than maximum range. The position of this circle is controlled by the range control and azimuth HUNDREDS OF ANGULAR MILS dial on the target designate control (3 and 9, fig. 19.3). 8. Track Electronic Cross. The track electronic cross appears once during each revolution of the rotating radial sweep when the sweep is coincident with the azimuth and range settings of the target tracking radar system. Computer Group. The computer group (1, fig. 19.2) is located against the roadside wall of the trailer mounted director station. The computer group consists of the computer amplifier relay group (1A, fig. 19.2), the servo computer assembly (1B, fig. 19.2), and the computer power supply group (1C, fig. 19.2). The computer group contains circuits for computing predicted target and missile positions and generating data for orders to the missile for target intercept and burst. In the ATBM system, circuits within the computer group have been modified to permit the anti-missile mission. The trailer mounted tracking station (fig. 20) contains the equipment required for operating the target tracking, target ranging, and missile tracking radar systems. Major units located within the trailer mounted tracking station are described in a though f below. a. Radar Coder Set. The radar coder set (9, fig. 20) is located against the curbside wall of the trailer mounted tracking station. The radar coder set consists of equipment that converts computer data into steering and burst orders which are transmitted to the Nike-Hercules missile. Coding equipment used with Nike-Ajax missiles is located in the upper part of the missiles is located in the upper part of the missile radar control console (2, fig. 20). The coding equipment used (Nike-Hercules or Nike-Ajax) is automatically determined when the battery control officer selects the type of missile for firing. b. Radar Power Supply Group. The radar power supply group (8, fig. 20) is located against the curbside wall of the trailer mounted tracking station. The radar power supply group consists of power equipment for the target tracking and missile tracking radar systems. c. Target Radar Control Console. 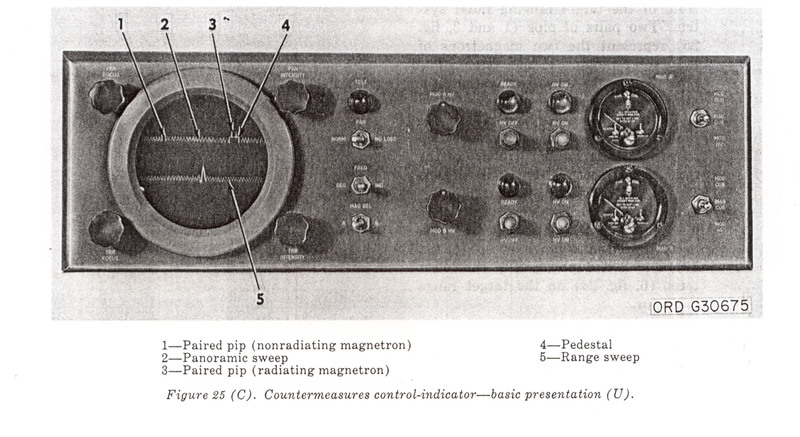 The target radar control console (7, fig. 20) is located against the front wall of the trailer mounted tracking station. The target radar control console contains controls, presentation indicators, and other equipment associated with the target tracking and target ranging radar systems. Data required by the tracking supervisor and elevation, azimuth, and target range operators during operation is displayed on the elevation indicator (1, fig. 21), azimuth indicator, (3, fig. 21), B scope indicator (4, fig. 21), target range indicator (5, fig. 21), and countermeasures control-indicator (2, fig. 21). The displays on the indicators are described in (1) through (5) below. Note. The key numbers shown in the parentheses in (1) and (2) below refer to figure 22 except where otherwise indicated. (1) Elevation Indicator. The elevation indicator (1, fig 21) displays two traces (1 and 5) that extend across the face of the indicator. Each trace represents a maximum range of 40,000 yards or 200,000 yards. A range notch (3) appears on the upper trace (1). When the target is being accurately tracked in elevation, the target pip (2) appears, centered in the range notch on the upper trace (5). When the target track antenna is directed below the target, an error pip (4) appears below the lower trace; when the target track antenna is directed above the target, the error pip appears above the lower trace. (2) Azimuth Indicator. The azimuth indicator (3, fig. 21) presents a display similar to the display on the elevation indicator (1, fig. 21). However, the display is interpreted in term of azimuth instead of elevation. When the target is being accurately tracked in azimuth, the target pip (2) appears in the range notch (3) on the upper trace (1), and no error pip appears on the lower trace (5). When the target track antenna is directed fig23 to the left of the target, and error pip (4) appears below the lower trace; when the target track antenna is directed to the right of the target, the error pip appears above the lower trace. (3) B Scope Indicator. The B Scope indicator (4, fig. 21) displays a sector of the PPI display covering 60 degrees (1066 mils) in azimuth and 220,000 yards in range. The vertical sweep (1, fig. 23) is an illuminated vertical line that extends from the upper edge to the lower edge of the face of the indicator. The vertical sweep corresponds to the rotating radial sweep (11, fig. 18) on the PPI, and travels across the face of the indicator from left to right in synchronism with the rotation of the selected acquisition radar antenna (HIPAR/AAR or LOPAR). The return signal (designated target) (2, fig. 23) appears as a brightened line on the face of the indicator. Because of normal B scope scan distortion, the return signal increases in length as it moves toward the lower edge of the face of the indicator, and decreases to a small dot when it moves to the upper edge. The target track antenna circle (3, fig. 23) represents the setting of the target tracking antenna in azimuth and range. For rapid acquisition of the designated target in azimuth and range, the operators adjsut azimuth and range controls until the target track antenna circle coincides with the return signal. All displays on the face of the indicator brighten once during each revolution of the selected acquisition radar antenna except the target tracking antenna circle. During a jamming environment, the azimuth video contains strobe information. The strobe line can be used to acquire jamming targets. (4) Target Range Indicator. The target range indicator (5, fig. 21) displays two traces that extend across the face of the indicator. Both traces represent a maximum range of 40,000 yards or 200,000 yards. The return signal that produces the target pip (2, fig. 24) on the upper trace (1, fig. 24) is obtained from the target tracking radar system. The return signal that produces the target pip (4, fig. 24) on the lower trace (6, fig. 24) is obtained from the target ranging radar system. The range notches (3 and 5, fig. 24) on the upper and lower traces represents the range setting of a common range unit which may be controlled by the target ranger operator. When the radar systems are accurately tracking in range, the target pips are centered in the range notches. (5) Countermeasures Control-Indicator. The countermeasures control-indicator (2, fig. 21) displays two traces across the face of the indicator. The upper trace is the panoramic sweep (2, fig. 25) and represents the tunable frequency spectrum of the target ranging radar system. Two pairs of pips (1 and 3, fig. 25) represent the two magnetrons of the target ranging radar system. The pips (3, fig. 25) representing the radiating magnetron are displayed on a pedestal (4, fig. 25). The position of the pedestal along the panoramic sweep represents the relative frequency of the radiating magnetron. The pairs of pips (1, fig. 25) not on the pedestal represents the relative frequency of a stand-by (nonradiating) magnetron. The lower trace is the range sweep (5, fig. 25), and is a duplication of the lower trace (6, fig. 24) on the target range indicator. d. Radar Set Group. The radar set group (3, fig. 20) is located against the roadside wall of the trailer mounted tracking station. 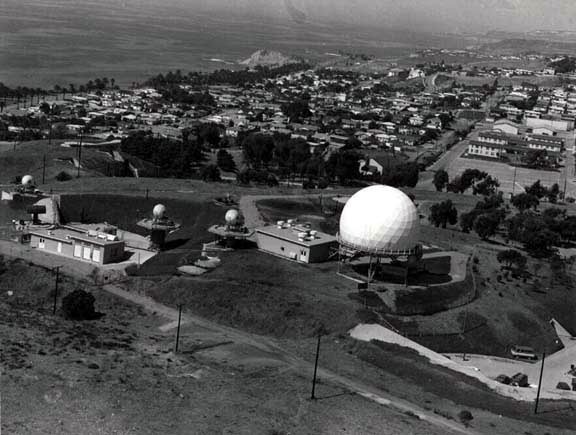 The radar set group consists of electrical and electronic equipment associated with the operation of the target tracking, target ranging, and missile tracking radar systems. e. Missile Radar Control Console. 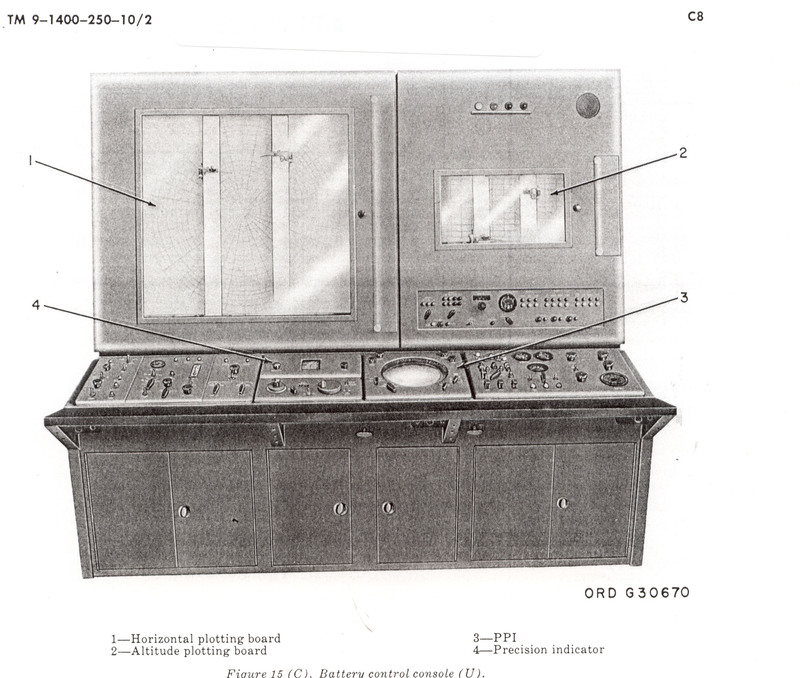 The missile radar control console (2, fig. 20) is located against the roadside wall of the trailer mounted tracking station. The missile radar control console contains controls, a range indicator, and other equipment associated with the missile tracking radar system. The range indicator (1, fig. 26) displays a single trace similar to the upper trace (1, fig. 24) of the target range indicator. The missile is tracked in range on the range indicator in the same manner that the target is tracked in range on the upper trace of the target indicator. The trace represents a range of either 52,000 or 200,000 yards, depending upon the type of missile (Nike-Ajax or Nike-Hercules, respectively) selected for the engagement. f. Target Ranging Radar Control. The target ranging radar control (1, fig. 20) is located against the roadside wall of the trailer mounted tracking station. The target ranging radar control contains controls, a test scope, and IF signal generator, power equipment, and other equipment associated with the target ranging radar system. Note. The key numbers shown in parentheses in a through f below refer to figure 27.
a. General. The LOPAR antenna-receiver-transmitter group (fig. 27) consists of the antenna and the receiving and transmitting equipment for the low power acquisition radar (LOPAR) system. The group consists of the acquisition antenna (2), acquisition antenna pedestal (5), acquisition receiver-transmitter (3), the acquisition modulator (4), and an auxiliary antenna (1). The pedestal, receiver-transmitter, and modulator are cylindrical tubs stacked one on the other. The auxiliary antenna is mounted on the acquisition antenna, The entire group is supported by a tripod secured to the pedestal at the top and to leveling jacks at the bottom. b. Acquisition Antenna. The acquisition antenna (2) is mounted on the acquisition antenna pedestal (5) and rotates continuously in azimuth during operation. The elevation scan of the antenna reflector is variable within the range of 0 to +391 mils. 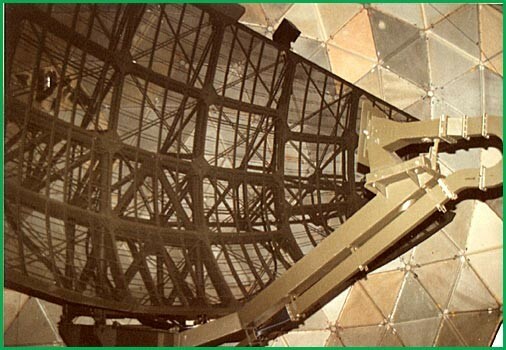 A protective Fiberglas radome encloses the antenna reflector. Selective identification feature/identification friend or foe (SIF/IFF) equipment is attached to a holding bar mounted on the lower portion of the antenna. c. Acquisition Antenna Pedestal. The acquisition antenna pedestal (5) supports the acquisition antenna (2). The pedestal contains the antenna drive equipment and the equipment that electrically couples the antenna, the acquisition receiver-transmitter (3), and the acquisition modulator (4). 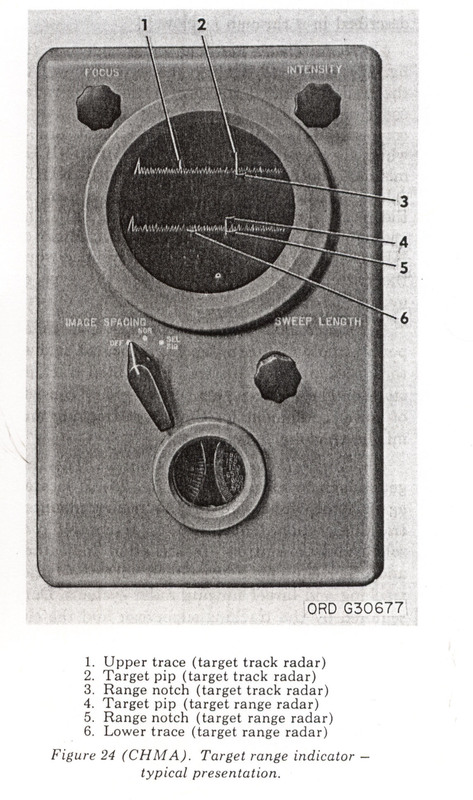 d. Acquisition Receiver-Transmitter. The acquisition receiver-transmitter (3) contains receiving and transmitting equipment associated with the LOPAR system. Built-in test equipment is incorporated in the acquisition receiver-transmitter to facilitate maintenance. e. Acquisition Modulator. The acquisition modulator (4) contains the high voltage and pulse generating equipment for the transmitting system of the LOPAR system. f. Auxiliary Antenna. The auxiliary antenna (1) is mounted on top of the main acquisition antenna and rotates in synchronism with it. a. Target Tracking Antenna-Receiver-Transmitter Group. 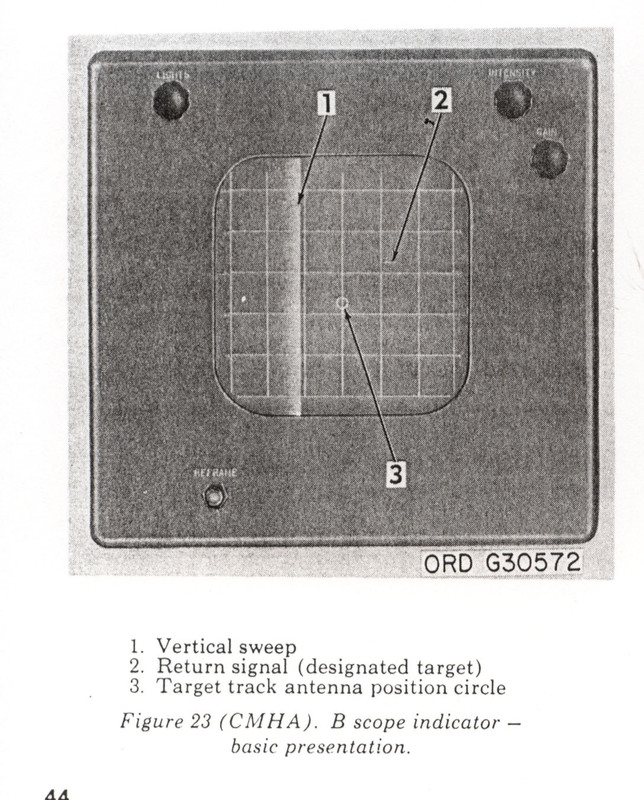 The target track antenna-receiver-transmitter group (fig. 28) consists of the antenna and the receiving and transmitting equipment for the target tracking radar system. The track antenna reflector and the target track receiver-transmitter are gimbal mounted on the enclosed by the track antenna support. (3 fig. 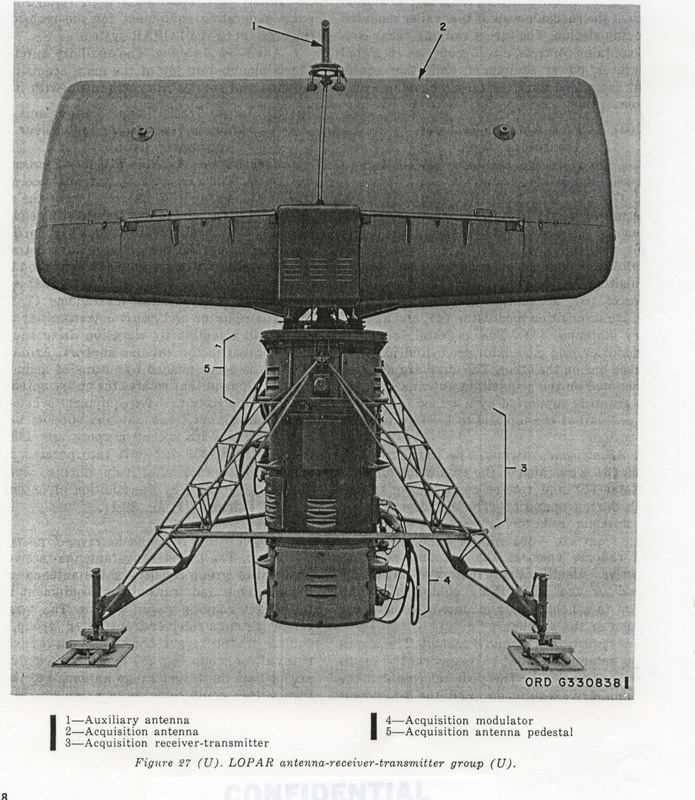 28) and enclosed by the track antenna radome (1, fig. 28). The reflector and the receiver-transmitter are rotated in elevation by elevation drive equipment located in the antenna support. Azimuth rotation is accomplished by means of azimuth drive equipment that rotates the entire antenna support. The azimuth drive equipment is housed within the target track antenna support base (2, fig. 28). With special purpose kits 1430-051-2916 and 1430-799-8679 incorporated, the ability to operate effectively during severe winds is increased by the addition of antenna pedestal fairings. b. Target Range Antenna-Receiver-Transmitter Group. The target range antenna-receiver-transmitter group consists of the antenna and the receiving and transmitting equipment for the target ranging radar system. The target range antenna-receiver-transmitter group is similar to the target track antenna-receiver-transmitter group (fig. 28) described in a above except that the target range antenna-receiver-transmitter group contains two receiver-transmitters. c. Missile Track Antenna-Receiver-Transmitter Group. The missile track antenna-receiver-transmitter group consists if the antenna and the receiving and transmitting equipment for the missile tracking radar system. The missile track antenna-receiver-transmitter group is similar to the target track antenna-receiver-transmitter group ( fig. 28) described in a above. 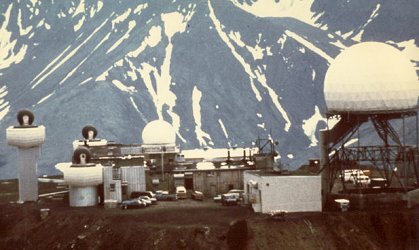 The radar test set group (fig. 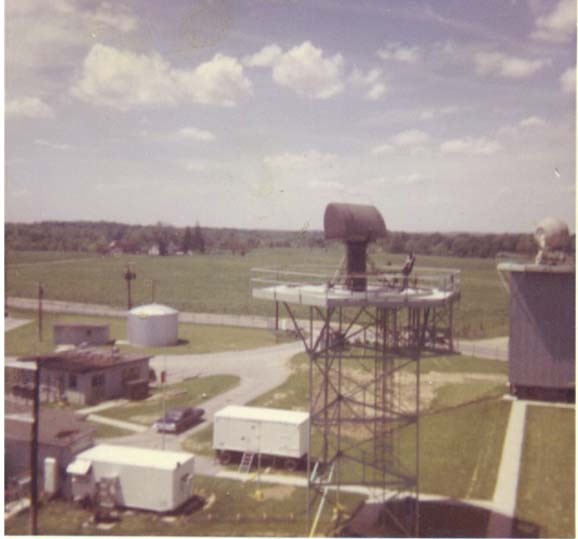 29) consists of the radar test set (2, fig 29). The radar test set group is used to align and test the target tracking, target ranging, and missile tracking antenna systems. The target track and missile track antenna reflectors are aligned optically by belwosighting and aligning the axis of the antenna reflector with a point on the graduated arms at the top of the antenna assembly-mast group (1, fig. 29). The target range antenna reflector is aligned and corrected for parallax by radiating rf energy form the target range antenna-receiver-transmitter group to the feedhorn at the top of the antenna assembly-mast group. The rf energy received from the feedhorn is converted to a dc voltage by the RF detector (3, fig. 29) to produce an indication of the alignment of the antenna reflector. 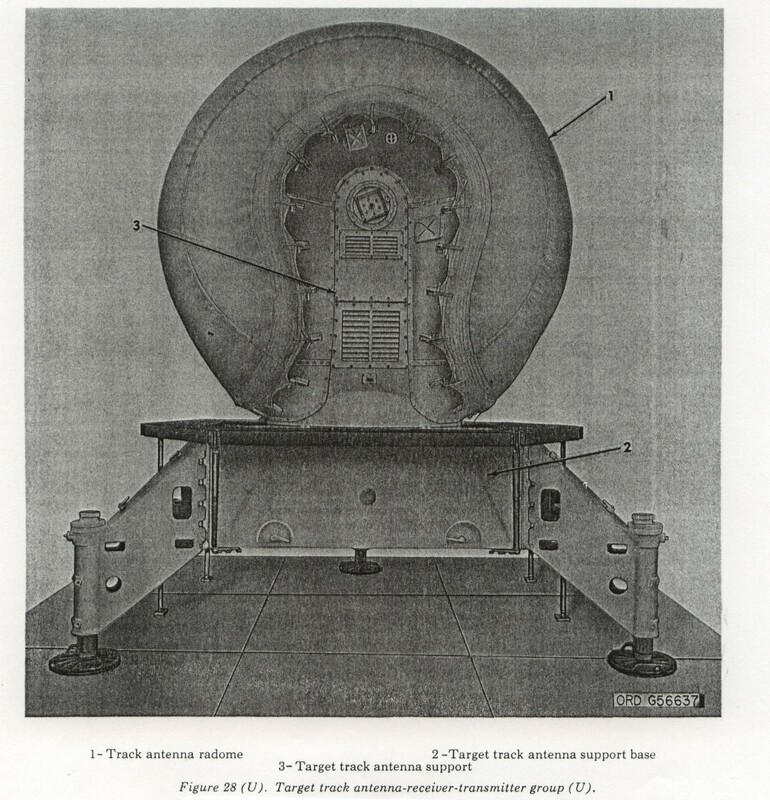 The radar test set (2, fig. 29) generates rf test signals that are radiated from the feedhorn at the top of the antenna assembly-mast group. These signals simulate missile transmitted signals or target return signals and are used in checks and adjustments of the missile and target tracking radar systems. The T! trainer (fig. 29.1) associated with the radar course directing central (RCDC), consists of trailer mounted equipment and interconnecting cables that provide simulated radar signals for training personnel in the operation of the RCDC. The positions and duties of the operators in the trailer mounted director station and the trailer mounted tracking station are described in a and b below. Note. The battery control officer is normally the battery commander. To cover the situation where the battery commander is absent and a duty officer is performing his duties, the designation "battery control officer" is used in stead of battery commander." (1) Battery control officer. Under normal alert conditions of surveillance or when an attack is expected but not in progress, the battery control officer's position (12) is the right operating position in front of the battery control console. (8). During an engagement, the computer operator takes over this position and the battery control officer takes over the center operating position (13) in front of the battery control console. In this position, the battery control officer can view and monitor the early warning information, local threat, equipment status, and conduct of the mission as displayed on the plotting boards and indicators. 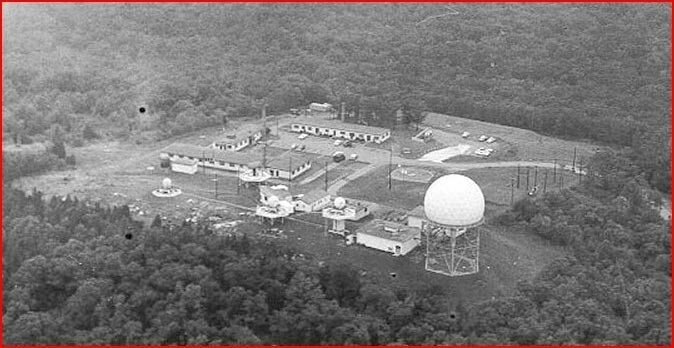 (3) Acquisition radar operator. The acquisition radar operator's position (7) is the left operating position in front of the battery control console (8). The duties of the acquisition radar operator include operation of the acquisition radar, both LOPAR and HIPAR/AAR, performance of target designation procedure, and operation of the SIF/IFF equipment in association with and under the direction of, the battery control officer. (4) Computer operator. The computer operator stands in front of the computer group (1) and places the computer group in full operation prior to an engagement. During an engagement the computer operator's position (12) is at the right end of the battery control console (8) in front of the altitude plotting board. This position occupied by the battery control officer prior to an engagement. The duties of the computer operator during and engagement consist of monitoring equipment status and operating tactical controls at the direction of the battery control officer. (5) Early warning plotting board operator. The early warning plotting board operator stands in front of the early warning plotting board (5) and manually marks target early warning information on the plotting board. The plotting board operator receives this plotting information over the telephone from an Army Air Defense Command Post (AADCP). (6) Switchboard Operator. The switchboard operator's position (11) is in front of the recorder group (9). His duties consist of operating the telephone switchboard and the recording equipment. (1) In the trailer mounted director station (fig. 19.2) for the Nike-Hercules ATBM System, the short range surveillance operator occupies the left chair at the battery control console, the battery control officer, the center chair, and the long range surveillance operator, the right chair. (2) Equipment available to the short range surveillance operator is the short range PPI (8, fig. 19.3) and the LOPAR control-indicator (7, fig. 19.3). (3) Equipment available to the long range surveillance operator is the long range PPI (4, fig. 19.3), the long range target designate control (3, fig. 19.3), and the HIPAR control-indicator (5, fig. 19.3). (4) The battery control officer is seated in the front of the fire control-indicator (6, fig. 19.3). He may monitor both PPI's from this position. (5) The long range and short range surveillance operators have radar and designation controls available to them. The battery control officer has his battery and firing controls directly in front of him and has access to the surveillance operators' controls. (6) The position and duties of the early warning plotting board operator and switchboard operator are the same as in an Improved Nike-Hercules System. Note. The key numbers shown in parentheses in b below refer to figure 20 except where otherwise indicated. (1) Azimuth Operator. The azimuth operator's position (5) is the center operator's position in front of the target radar console (7). The azimuth operator monitors the B scope indicator (4, fig. 21) and the azimuth indicator (3, fig. 21). The duties of the azimuth operator are to acquire and track the designated target in azimuth. The azimuth operator is responsible for signaling the battery control officer that the target is being tracked or is not being tracked. (2) Elevation Operator. The elevation operator's position (4) is the left operating position in front of the target radar console (7). The elevation operator monitors the elevation indicator (1, fig. 21). The duties of the elevation operator are to manually search for, acquire, and track the designated target in elevation. (3) Target Range Operator. The target range operator's position (6) is the right operating position in front of the target radar control console (7). The target range operator monitors the B scope indicator (4, fig. 21) and the target range indicator (5, fig. 21). The duties of the target range operator are to manually track and gate the designated target in range. (4) Tracking Supervisor. The tracking supervisor's position (6) is centered behind the positions of the azimuth, elevation, and target range operators. The tracking supervisor monitors the B scope indicator (4, (fig. 21) , counter-measures control-indicator (2, fig. 21), and the elevation, azimuth, and target range indicators, (1, 3, and 5, fig. 21). The duties of the tracking supervisor are to coordinate and supervise the operation of the target tracking and target ranging radar systems, and when the countermeasures control-indicator indicates that interference is present, to utilize the techniques required to maintain effective operation. (5) Missile tracking operator. The missile tracking operator's position (11) is in front of the missile radar control console (2). Under normal operating conditions, he is continuously advised of the equipment status when a target have been designated, acquired, and tracked. After a missile has been designated and acquired, he ascertains, by means of indicators on the console, that the missile tracking radar system is locked on the designated missile. After the missile is launched, he monitors the range indicator to see that the missile is being accurately tracked. Under emergency conditions, in addition to monitoring missile tracking before and after launch, the missile tracking radar operator can manually select the launching section and missile to be fired and designate "missile ready" and "missile fired" by means of controls on the console.